The Markit “Purchase Managers Index” figures have proven to be very accurate indicators of how various major economies are performing, giving insight into whether we can expect expansion or contraction. The latest composite Eurozone figures are somewhat depressing, but may indicate that any recession the EZ may enter will be fairly shallow and *may* have already bottomed in terms of the rate of decline. 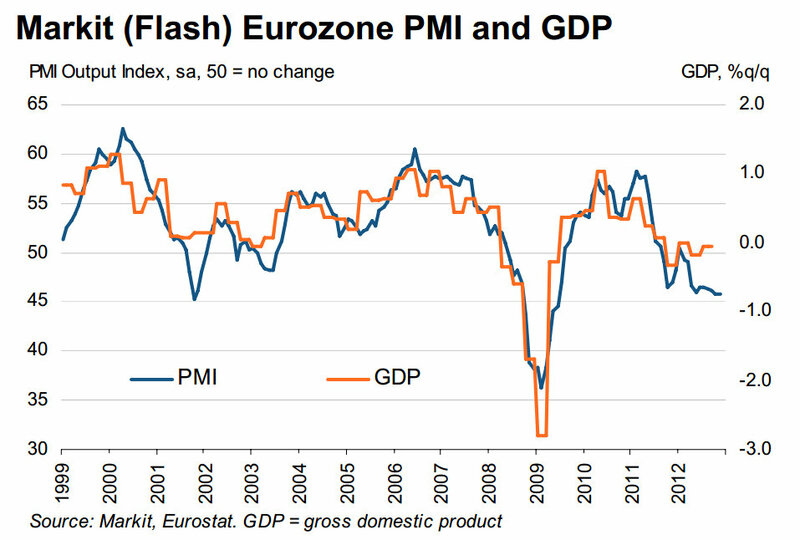 GDP data is often corrected several months after its first release and this may well occur for France and the whole Eurozone. Alternatively we can expect government borrowing data to be worse than anticipated as they attempt to fill the gap caused by private sector contraction. Sadly my feeling is that France’s new President and government are creating uncertainty, rather than reassuring the market and business community. Unlike every other EZ economy, they are attempting to undo some much-needed reforms and actually increasing the deterrents to do business in France. So far there is little commitment from the government to improve competitiveness or re-balance the economy away from government spending (currently 57% of France’s GDP is government spending!). 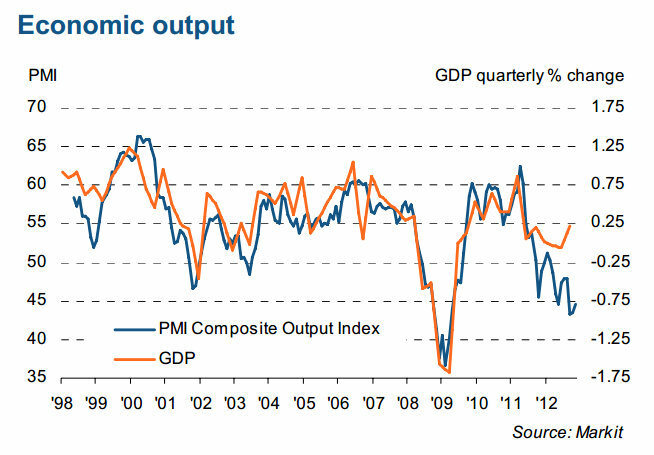 This does not bode well for the French economy and by extension the whole Eurozone’s! On the positive side, the ECB has called the market’s bluff and threatened to buy Eurozone government bonds to keep the yields of major economies like Spain at sustainable levels. So far it has worked without having to spend €1 and has bought EZ governments much needed breathing space.